The provisions of the Geologic Mapping Act of 1992 and its reauthorizations in 1997 and 1999 (PL106-148) require the U.S. Geological Survey (USGS) to design and build a National Geologic Map Database (NGMDB), with the assistance of the state geological surveys and other entities participating in the National Cooperative Geologic Mapping Program. After discussion among the principal architects of the NGMDB, a general plan for its initial design and evolution was proposed (Soller and Berg, 1995); minor updates to the plan, enhancements, and progress reports have been presented annually since 1997 (for example, Soller and Berg, 2000, and this volume). The NGMDB design identifies three complementary phases to the project. Because many geologic maps are not yet in digital form and because many organizations produce and distribute them, it was decided to first identify and catalog all geoscience maps in the United States, in either paper or digital format. This first phase, a searchable map catalog, is the most fundamental aspect of the NGMDB; it enables users to identify whether a map has been produced for their area and/or theme of interest. The map catalog presently is supported by two additional databases developed under the NGMDB project: 1) GEOLEX, a searchable geologic names lexicon; and 2) Geologic Mapping in Progress, which provides information on current mapping projects. When each mapping project concludes, their map products will be entered in the map catalog. The second phase of the project focuses on public access to digital geoscience maps, which in turn requires the development of certain digital map standards and guidelines to improve the utility of those digital maps. This is an extremely important activity that requires a high level of interaction with all stakeholders to ensure that any proposed standards and guidelines are useful, necessary, and will be widely adopted. Although these activities produce valuable information for the public and the geoscience community, the ultimate goal of the NGMDB project is to create an online database containing geologic map information that can be queried, customized for display, and downloaded. Further, the map information in the database would be a coherent whole composed of the best information compiled from various map sources. The database would be updated as new maps are published and so could be termed a "living", or dynamic database. The design and implementation of this database constitutes the project's third phase. Work on the third phase has begun, and is the subject of this paper. available to the public via Internet browsers and common GIS tools (e.g., ArcExplorer). Designs and implementations for this database are being evaluated through a series of prototypes. Each prototype is designed to prove key technical concepts, forge relations and agreements among the contributors to this database (i.e., principally, the nation's geological surveys), and amass a growing collection of geologic map information. In 1999, basic requirements for a prototype geologic map database were designed, and concepts were tested using some newly-developed digital data for the Greater Yellowstone Area of Wyoming and Montana (Wahl and others, 2000). That first prototype was presented for discussion at the Geological Society of America Annual Meeting, in October, 1999. The prototype was well-received, and plans were begun for a second prototype, with a more complex set of tasks. proven statewide economic benefits from the geologic mapping. In 2000, funds were secured, contracts were written, and the work began in mid-year. The results of this "Kentucky prototype" are discussed in detail below. Implement the North American draft standard conceptual geologic map data model, in an object-oriented software architecture (in this discussion, the term includes object-relational architecture). The current version of the data model endorsed by the North American Data Model Steering Committee (http://geology.usgs.gov/dm/), v.4.3, is relational. An object-oriented architecture was selected in order to explore its potentially greater facility for representing and managing complex spatial information. Because the map database may contain multiple source maps and multiple versions of maps generated as each map is compiled into the database, the selected O-O system must be capable of managing multiple versions of each object on a map (e.g., the outcrop belt of the "X" Formation as shown on various maps of a region), and a large number of editorial changes to each object as submitted by various authors, compilers, and editors. Manage information derived from multiple source maps. The KGS is conducting a program to convert to digital form the entire statewide coverage of published,1:24,000-scale geologic maps (Anderson and others, 1999). For this prototype, a few quadrangles were used, to demonstrate the system's capability. Demonstrate links between the prototype map database and related geoscience databases (i.e., the KGS oil and gas database, the USGS geologic names lexicon). Conceptually, the user could select a map unit and, upon request, view the summary of information about the unit's geologic name, which is stored in a separate database. Develop the capability for users to extract selected areas of the prototype map database for downloading to a personal computer, in a selectable file format (e.g., georeferenced image or ArcView shapfiles). Evaluate the interagency, collaborative nature of this effort, especially mechanisms by which agencies can retain ownership of their data when held in a jointly-built database. The first task, implementing an object-oriented data model and demonstrating its compliance with the North American Data Model, was emphatically the principal and overriding concern of this prototype. A preliminary presentation of the Kentucky prototype was made during the annual NGMDB evening presentation at the Geological Society of America's Annual Meeting in November, 2000. In the months following, the prototype system was designed and made available for demonstration and public comment at the Digital Mapping Techniques 2001 meeting. Below, progress toward the prototype's objectives is described. Descriptors: the digital values chosen to characterize map Symbols, Concepts, and Occurrences (commonly apparent/derived from the map narrative). These four meta-objects are related in the model's core "diamond diagram" (Figure 1). In summary, map Symbols cartographically depict both Concepts and Occurrences in manifold ways. Occurrences may be symbolized on the map figure, or, if (too) numerous, small, dense or sparse, etc., may be classified and symbolized as a group Concept through the legend. Descriptions, which may be either incidental or normative, can be applied to Concepts and Occurrences equally, and also to Symbols as needed. This entire meta-structure is infinitely mutable, but operates essentially in two major directions: elaboration of Concepts, which leads into geologic ontology (what we know); and elaboration of Occurrences, which leads into geologic epistemology (how we know)." Figure 1. Core of the geologic map information meta-model. The rectilinear arrows indicate relationships between meta-objects, and the reflexive arrows indicate self-referential hierarchies within the meta-object classes. This data model was implemented in a mature object-oriented GIS/database, GE-Smallworld. [See details at http://www.gepower.com/prod_servv/products/gis_software/en/]. This software, widely used for intricate map/database management in the electric utility industry, was tested for its applicability to geologic objects (i.e., features such as faults, contacts, and map units, and also regional names and sampling points). Preliminary results are encouraging, and the software will be further explored in the next prototype. The second objective also was completed, by loading four adjacent 1:24,000-scale geologic quadrangle maps and managing them as both discrete entities and as a coherent whole. In the future, a substantial number of such maps in Kentucky will be loaded into the system, to evaluate the ability to manage, query, and display a large collection of map data. View exported map data in third-party GIS viewer. The demonstration was conducted live, over the Internet, with a laptop "user" computer in Tuscaloosa, Alabama accessing the GE-Smallworld map server at the USGS offices in Denver, Colorado via a T-1 (1.544 Mbps) line. Several members of the audience remarked that performance was excellent. Display an orienting map showing available data: Figure 2 shows an overview map of Kentucky with the available map data highlighted. This demonstrates a fundamental point - maps can be nested (i.e., a map of maps) and inter-related. Also, the system needs to store map footprints, as well as base maps, in the data model; these map objects can be related to metadata about the source documents to facilitate map-based queries. Select a map area, zoom and pan: Figure 3 is a detailed view of the map area selected in step 1. To facilitate readability during zoom operations, the level of geologic detail must be appropriate to the map view (i.e., at larger scales, more detail is revealed). This requires several levels of map detail that can be accessed as the user increases the magnification. Also, map symbology must be scale-sensitive, thereby allowing the cartographic display to change according to the zoom level. In this demonstration, geologic features were assigned scale-dependent symbolization at the system level. Alternatively, software methods could be designed to achieve this functionality. Display and query external databases: To maximize the utility of a geologic map database, it must be useable in concert with the variety of other spatial and non-spatial databases (e.g., census/demographic and economic data; topographic and hydrologic data; and geoscience data including engineering, mineral occurrence, and seismic). Already, and increasingly in the future, access to these databases is via the World Wide Web. Accordingly: a) the geologic map display and database should be Web-enabled; b) there must be stable links to external databases; and c) the system must display, read, and manipulate spatial data in foreign formats. In the demonstration, two external databases were remotely accessed, and queried, in concert with the geologic map data (Figures 4a and 4b). The dynamic link to these databases was demonstrated by the instantaneous update of the display following modification of the external oil and gas database shown in figure 4a. Perform spatial analyses: New thematic information and interpretations can be derived from geology and other databases, on-the-fly. This is perhaps the most critical function of an online, user-accessible map database; it must be an efficient and user-friendly process, otherwise the map database serves as little more than a digital storehouse for previously-published maps. Figure 5 displays the map database (with rock units reclassified by lithologic composition) and external databases (oil and gas wells, and stream traces). The spatial analysis accessed information from all databases and returned a result that identified karst-prone geologic units that were proximal to oil and gas wells. Create derivative maps from analyses: In order to generate a derivative map from database queries and analyses, either the user must compose a suitable map legend and symbology, or else the system must be capable of dynamically generating this information. The latter approach provides a powerful tool for the user, but it requires a system and data model capable of traversing and interpreting relations among the various data and data model tables. Figure 6 shows a map of primary lithology, where the symbology is automatically generated. strong coordination must exist among cooperating agencies and users, in order to ensure success of the above two items. The prototype system uses a well-known import/export tool, FME (Feature Manipulation Engine, ), with support for essentially all the common GIS file formats. As stipulated in the Geologic Mapping Act, the NGMDB is intended to be a State-Federal collaboration. It is therefore essential that each prototype draw together the collaborators, to ensure that together they study the project goals and the available technology, and define the scope of their involvement in it. This is perhaps the most important and challenging, yet ultimately rewarding, aspect of the project. The Kentucky prototype fulfilled this objective by bringing together a diverse group of scientists and technical experts to address the needs of both the Kentucky Geological Survey and the NGMDB. Although it is premature to describe the eventual design and content of this online database, the working relations built during this prototype indicate that a national, jointly-built and maintained database is feasible. The Kentucky prototype demonstrates that a multi-map database supported by robust object-oriented concepts and technology can provide users with simple data access, complex queries, and derivative information and maps. This prototype begins to explore the nature of a mature system, where data can be exported, edited, and replaced into the database (i.e., a "closed loop"). Subsequent prototypes will further test the technology to develop a user-accessible database, and will explore among the NGMDB partners the extent to which this online database will serve the needs of both partners, their prospective customers, and the general public. Anderson, W.H., Sparks, T.N., Patton, J.A., Yang, Xin-Yue, and Sergeant, R.E.,1999, Integration of Relational Geologic Databases and a Spatial Map Database in Kentucky, in D.R. Soller, ed., Digital Mapping Techniques '99 - Workshop Proceedings: U.S. Geological Survey Open-File Report 99-386, p.123-125, https://pubs.usgs.gov/openfile/ of99-386/anderson1.html. Hastings, Jordan, and Brodaric, Boyan, 2001, Evolution of an Object-Oriented, NADM-based Data Model Prototype for the USGS National Geologic Map Database Project: Proceedings of the 2001 Annual Conference of the International Association for Mathematical Geology, Sept. 6-12, Cancun, Mexico http//www.kgs.ukans.edu/Conferences/IAMG/Sessions/l/brodaric.html. Soller, D.R., and Berg, T.M., 2000, The National Geologic Map Database: A Progress Report, in D.R. 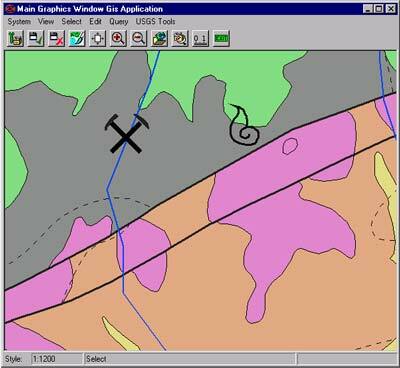 Soller, ed., Digital Mapping Techniques '00 - Workshop Proceedings: U.S. Geological Survey Open-File Report 00-325, p.27-30, https://pubs.usgs.gov/openfile/of00-325/soller2.html. Soller, D.R., and Berg, T.M., 1995, Developing the National Geologic Map Database: Geotimes, v. 40, no. 6, p. 16-18. Soller, D.R., Berg, T.M., and Wahl, Ron, 2000, Developing the National Geologic Map Database, Phase 3 - An Online, "Living" Database of Map Information, in D.R. Soller, ed., Digital Mapping Techniques '00 - Workshop Proceedings: U.S. Geological Survey Open-File Report 00-325, p.49-52, https://pubs.usgs.gov/openfile/of00-325/soller4.html. Wahl, R.R., Soller, D.R., and Yeldell, Steven, 2000, Prototype Implementation of the NADMSC Draft Standard Data Model, Greater Yellowstone Area, in D.R. Soller, ed., Digital Mapping Techniques '00 - Workshop Proceedings: U.S. Geological Survey Open-File Report 00-325, p.57-63, https://pubs.usgs.gov/openfile/of00-325/wahl.html.